Beier Machinery high speed PVC mixer machines are mainly used for mixing, colouring, drying and others. In plastic, rubber, food-stuff, daily chemical industry and so on. PVC mixing machine is an necessary auxillary machine for making plastic pipes, plastic profiles, plastic board, WPC extrusion line, cable production line, etc. 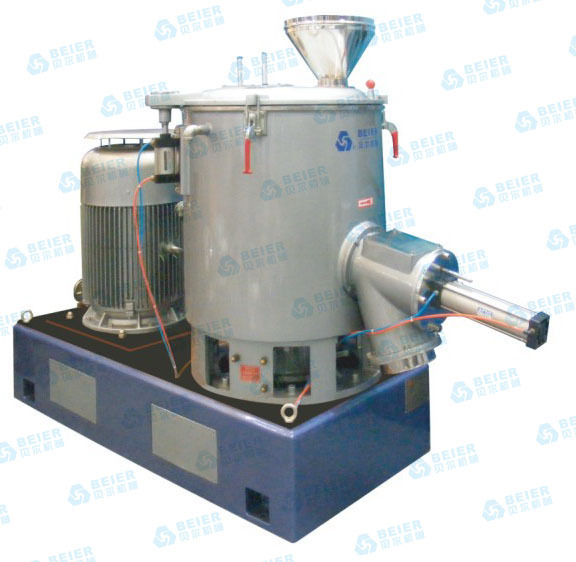 PVC Mixer Machine‘s function is to mix the raw material with different kinds of additives. Usually for pvc powder material, you need to use high speed heater mixer and low speed cooler mixer, which means mixer unit. For making PP PE masterbatch, or cable, one high speed PVC mixer machine is ok.
1. Beier Machinery can supply not only heater mixer machine, but also hot&cool mixer unit. 2. The cooler mixer adopts horizontal structure with the characteristics of large cooling area, fast speed, more homogenized. 3. The mixer cover is double sealed and opened in pneumatic way. 4. The electric control system adopts RKC, Siemens, ABB, Omron and other famous instruments and control components to ensure quality and realize automatic control. 5. Both the blades and the belt wheel have been specially treated through the balancing machine of static and dynamic.